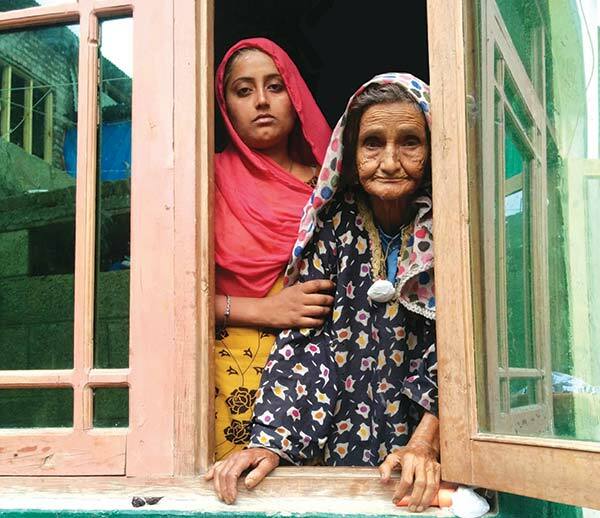 Asiya with her grandmother Faze at their one room house in Srinagar. Pic: Humera Ashiq Hussain. The devastating flood, previous year, in its wake, has left indelible reminders in the house. The cracks and crevices look like a reflection of the wizened face of Musmate Faze, the octogenarian owner of the house. The single room house, located in Mehjoor Nagar, looks like a forgotten ruin of misfortune by its dilapidated condition, the metaphor of loss for the old lady. However, more than the abject condition of her house, the tragic episodes of her life have broken the spirit of Faze, a lady once known to be exuberant and vivacious. Presently, living in a dingy room, less spacious and insalubrious, in a small house in Zaffran Colony of Mehjoor Nagar, Musmate Faze, with her draped in a tattered veil, relates the events of her dejected life. However, these troubles fade when Faze weights what she has suffered as a mother. “No male progeny of mine survived. All my seven sons died very young leaving me to bear the pain all my life,” sighs Faze with a dismayed face. The aged lady elaborates on her misfortune. All the sons of Faze died very young, except her third son, Gulam Nabi Bangla. A laborer by profession, he worked from dusk till dawn to make the ends meet. But when he turned 30, he had brain hemorrhage due to abrupt increase in his blood pressure adding another chapter in the epic tragedy of Faze. However, her son had died after marrying, leaving a daughter Asiya. It was no consolation to the family, as Asiya’s mother, Maymoona was a mute lady. No words escaped her lips all her years of existence, besides she only understood Bengali as she hailed from Kolkata. Unable to afford a Kashmiri wife because of poverty, Asiya’s father had bought his wife for a few hundred rupees. In the last years of her life Maymoona became paralyzed and Asiya took care of all her needs. “We never exchanged a word in all her life, as she couldn’t speak and understood only Bengali while I could only speak Kashmiri. But we understood each other through the language of love we shared,” says Asiya. Donning a yellow decrepit Shalwar Kameez with a tattered maroon veil covering her head, the only outfit she owns and has been wearing for a few years now. “With every wash it looks better,” says Asiya with a wry smile. The scarred abdomen, with stitches, faded corporally but imprinted vividly in her memory, draws a perfect analogy of her sufferings. “Everything and everyone belongs to Allah. Even our children don’t belong to us. Sometimes I request people to pay me a visit,” says Faze with a twinge of pain in her voice. Faze is virtually a deaf person now. It is extremely difficult to make her understand spoken words. Ailments have affected her body. Complaining of acute back and knee pain, she has a hard time buying medicines for herself. Every day she frequents Ram Bagh Bridge and asks for alms. A common sight at the bridge – listless with a frothy mouth, only some pass without sympathy for the aged lady. Originally hailing from Chattabal, Faze lives in the neighborhood of her daughter in Mehjoor Nagar. Asiya lost her life time possession in the floods, a suit case; which contained some dresses she had preserved for her wedding, a gold chain, a gold earring. “Flood had taken its voyage. God knows where it found its harbor,” chuckles Asiya. The family lives in a dilapidated room with no concrete roof. Polythene bags have been used as canopy for this unfortunate family. Some neighbors have come forward and have promised the family assistance at constructing a roof for them. Neighbors claim that Faze is possessed by an evil fairy. Faze confesses Kashmiri songs ringing in her ears sometimes. She has come to live with the ailments both physical and spiritual. Confessedly, she is happy on this day. There is a glow in her faded green eyes, reminder of the beauty of her former years. Donning a turquoise Pheran with a floral imprint, and a white floral scarf, Faze smiles languidly. As I take leave of the family Faze sighs and looks at the canopy of polythene bags. A streak of light has escaped the chink of her roof dappling her face. An amulet hanging down her neck shakes, she pressed the amulet to her bosom with a withered hand. Can you please share some more details on my email id, as in how I can reach her? Thank you for highlighting her painful story. Tell me how can I help her? Muhammad Yaseen Sanu ,Zaffar coloney, Mehjoor nagar, 8713915815..
Good Job. Hope your highlighting their plight might change their life for Good.